Welding process critically determines the end result of a particular job especially in the Steel Fabrication. Therefore, fabricators and manufacturers try to develop their products to meet the increasing demand from industrial market. From the manually welding equipment to the automatic one, everything is being invented to enhance productivity and quality. Let us look into how to select the right welding equipment, for instance wire feed unit, which can make a critical difference in the overall efficiency of a welding operation. In the welding process, numerous factors impact weld quality. A good weld, in terms of quality and quantity, should pass the visual test, mechanical test (in compliance with the Code or specification), and should have been performed efficiently. This can be achieved by assigning the right skilled welder/welding operator, monitoring the welding process consistently, and using the correct welding equipment. To place welding wire (including welding plier and nozzle) and the shielding gas protection system. To control wire electrodes usage (for a certain type of feeder, the control unit is separate from the wire feeder). To facilitate the welder/welding operator as the unit is movable. Good quality, meaning that the wire feeder will not get stuck or stop abruptly during welding which will cause a defect. Some defects that may occur due to the poor quality of a wire feeder are crater cracks at the stop position as a result of the sudden absence of welding flame, or porosity as a result of the improper coverage from shielding (gas or sand). When such defects occur, the defected area of a weld must be grinded until it is completely removed, then we need to re-weld. We might want to avoid a re-weld as the outcome from this process is low quality. Only require a small adjustment. When handling a wire feeder that requires a lot of adjustment, a welder or welding operator will waste their time setting up the unit and may produce inhomogenous weld, which is a low quality weld. High flexibility. Wire feeder will be the solution to the limited space of a welding shop. It can be adjusted to fit the work space so that the welder or welding operator can use it easily. High stability. The prime function of a wire feeder is to keep the stability of the welding wire so that welder or welding operator will produce a uniform weld visually and technically. We need to ensure that the wire feeder we are using has a good stability before using it. The wire feeder has different setting for every different sizes of welding wire. 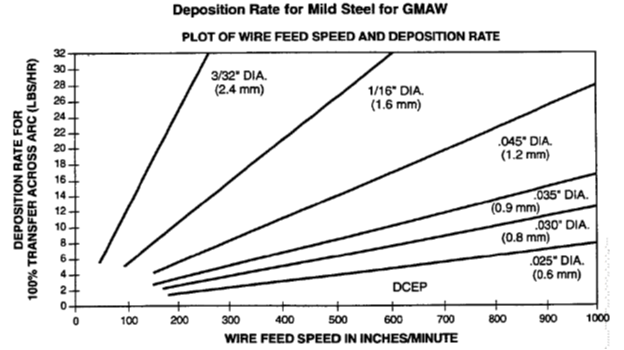 The following graphic can be a guide to determine the deposition rate based on the wire feeder speed. From the graphic shown above, we may conclude that the higher the speed of a wire feed, the lower the deposition rate, and vice versa. The smaller the welding wire is, the smaller the deposition rate will be. Many things can be achieved by setting up the wire feeder accordingly in compliance with the existing procedures. Wire feeder is more important than many realize. Referring to ASME Section IX year 2013 QW-404.1 an increase of greater than 10% in the cross‐sectional area of the filler metal added (excluding buttering) or in the wire‐feed speed beyond that qualified and is considered essential in the Electron Beam Welding (EBW).